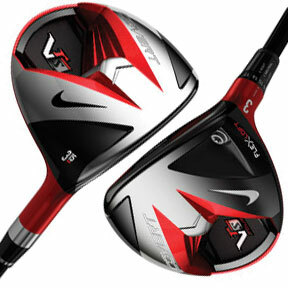 To see the latest Nike golf clubs, please visit our Nike fairway woods or Nike hybrid pages. The Nike VR_S Covert fairway woods and VR_S Covert hybrids go above and beyond other woods on the market with their breakthrough technology and distinct aesthetic. Like the VR_S Covert driver, the fairway woods and hybrids feature a revolutionary hidden cavity back sole design. This High Speed Cavity is created by redistributing material from the back of the club to the heel and toe. This increases the MOI (Moment of Inertia) and produces almost the same ball speed on slightly off-center hits as it would when hit directly on the sweet spot. Another great feature of the VR_S Covert line is its high-strength stainless steel face with Nike's proprietary NexCOR technology. In the same way the cavity back design used to belong only to irons, NexCOR was previously only found in Nike's VR_S STR8-FIT driver but is now used in all VR_S Covert woods and hybrids. NexCOR technology is a face design that is thicker in the center and thinner around the edges. This expands the sweet spot, creating a larger effective hitting zone that minimizes power loss on impact. Together with the cavity back sole, NexCOR makes the VR_S Covert fairway woods and hybrids exceptionally playable golf clubs. 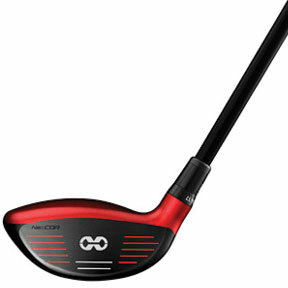 The VR_S Covert comes in two models: standard and Tour. There are two major differences between them. The standard VR_S Covert 3 and 5 woods, as well as the 2, 3, 4 and 5 hybrids, have glued hosels. The Tour versions, however, feature FlexLoft technology, a dual-axis adjustable hosel similar to the one found on the VR_S Covert driver. This lets you adjust the face angle to Open, Closed, or Neutral positions and the loft angle within a 5-degree range. It also lets you make adjustments independently of each other; in other words, you can change the face angle without changing the loft. A torque wrench is included to make fine-tuning your club even easier. The other main difference between the VR_S and VR_S Tour is the paint scheme. Both have rich red crowns, angular cavities and contrasting Swoosh emblems, but the Tour version uses a black finish on the sole and face while the standard version uses a chrome finish. The standard and Tour models both come with Mitsubishi Diamana Kura Kage shafts. According to Robert Boyd, Nike Golf's Innovation Team Leader for metal woods and irons, both models are close to hitting the USGA limits on COR (Coefficient of Restitution), but still conform to USGA and R&A rules. As part of the Nike VR_S Covert series, the VR_S Covert fairway woods and hybrids are ready to make the entire industry rethink club design. Their sophisticated new engineering and eye-catching looks guarantee a lasting impression, if not a total game change.